94.78 Acres +/- of Residential, Recreational, Timberland, with Electric, City Water, & Telephone For Sale!! Newly Built Home on 2.94 Acres +/- in the Oxley Community of Leslie, Arkansas. 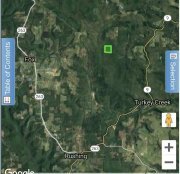 40 Acres +/- of Recreational Hunting & Timberland in Stone County, AR. For Sale!! 72 +/- Acres in Montgomery Co Arkansas Bordering the Ouachita National Forest. Great deer, turkey and bear hunting! - 125+- Acres along L' Anguille River just north of highway 64. Mixed use Recreational, Rice, and Beans. - Beautiful 58.29 Acres +/- on Bear Creek !! Located Approximately 24 miles from Branson, MO. & 24 miles from Harrison, AR. - HUNT, FISH and FARM! A Unique Property with CRP and Private Lake! - 240 Acres +/- Cattle farm with Great Hunting and Beautiful Building Sites just South of Mountain View, Arkansas 72560. Arkansas is a land of many rivers and diverse natural beauty. Bordered on one side by the majestic Mississippi River and bordered by Tennessee, Missouri, Oklahoma, Texas, Louisiana, and Mississippi, this Southern state has a prime location. Although Arkansas makes most of its revenue from the service industry, agriculture is next, with rolling farmland covering 36% of the state. Right now is a perfect time to look for land for sale in Arkansas. Arkansas has a deep history in agriculture which is why it is still one of its staple industries today. The state also has a thriving tourism industry, as home to former President William Jefferson Clinton and the Presidential Library in Little Rock, and breathtaking natural beauty. With everything this state has going for it, now is a great time to buy land in Arkansas. Arkansas has a history of rebelliousness. It joined the United States in 1836, only to secede in 1861 and become one of the Confederate States. After the Civil War, Arkansas fell behind economically but began to diversify its economy after World War II. Its modern industries include agriculture and petroleum-based products. It is known as The Natural State because of its incredible natural beauty, with mountains, rivers, streams, natural caverns, and gorgeous views. It also applies to the friendly citizens who have a reputation for Southern Hospitality. The geography of Arkansas is diverse and essentially split in half. The north-west consists of highlands including the Ouachita Mountains and the Ozark Mountains. The lowlands of Arkansas are the southern Gulf Coastal Plain. The eastern border of the state is the Mississippi River, and the area is known as the Arkansas Delta due to the repeated flooding of the Mississippi that has resulted in rich, fertile soil. The interior of Arkansas has fertile prairie land. There are large plots of land for sale in Arkansas, including hundreds of thousands of acres of farmland. There are plenty of affordable properties for sale in Arkansas if you just know where to look. There is also abundant hunting land available in Arkansas. Hunting is a favorite sport here, and this time-honored tradition includes hunting for plentiful deer, wild turkey, elk, birds, and waterfowl. Arkansas has a diverse, modern economy that includes the agriculture, mining, manufacturing, and service industries. The broiler chickens are the most critical livestock crop and are sold as chicken parts or whole chickens. Chicken eggs, turkeys, and aquaculture are also essential sources of revenue. Arkansas is the leading producer of rice in the U.S. and is the second largest producer of soybeans. Corn and corn for grain round out the top 5 crops. Land for mining natural gas is abundant in Arkansas. Natural gas is it's number one mined product. Petroleum is also extracted from giant oil fields near the Louisiana border. Finding land for sale in the beautiful state of Arkansas is an excellent idea for all of the above reasons and more. Want to see your Arkansas property listings on Land Broker MLS? Join our co-op by signing up today.